The sender of this update posted it to me in the comment section, however, I still feel the need to put it up as a post, so that the world will read and see how injustice are being meted out to helpless Nigerians. The police stated that the guy may have drank a poisoned bottle of coke? And as the sender rightly asked, poisoned coke he got from where? Did it just miraculously appear inside the cell? Someone who turned himself to the police, paid some outstanding amount to the bank in order to offset the alleged money. Yet was tortured and murdered for mere #1.2 million naira!!! Why don’t we value life in my country? What amount of money is larger than life? 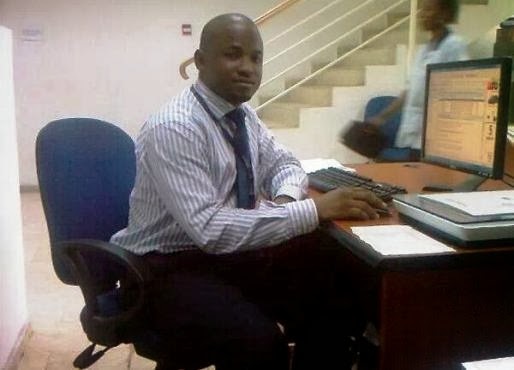 Tunde was accused of a missing 1.2million from eco bank, ladipo where he worked sometime late last year. He was asked to refund the money amount. According to Tunde, someone posted the money with his computer system. However, Tunde made effort to repay the funds, and in the process his account was put on hold and that of his wife who works with the bank (they could no longer make withdrawals from their acct). Tunde was able to to repay 600k before the events that led to his arrest. On Sunday the 16th of feb, Tunde had a fire accident in his residence, his generator exploded, leaving burns in his hands and legs. Tunde went with the burns to the office on Monday to show his branch manager and explained that he wont be able to stay at work for the day. On Tuesday 18th Feb Tunde was on his way to clinic and some persons Ecobank called his wife to inform her that they were coming to arrest her at her branch since d husband has absconded. She quickly placed a call to her husband to inform him and her husband reported immediately to work abandoning his treatment due to the threat. Tunde was arrested at work on Tuesday and taken to the divisional headquarters at Ikoyi where he was locked up for 3 days. All efforts to get his bail went futile as the police insisted that based on the instruction of the bank, they must get the outstanding. was also discovered later that a coke bottle cover was placed in his pocket. The police started alleging poison that he took a poisonous coke. Now am wondering, poison from where? This is the story so far. We are waiting for autopsy results but the media must be at alert… the process must b corruption free. Eco bank and the NPF will be doing all they can to bribe as many as possible….anyone who takes bribe on this issue will die a miserable death in Jesus name! This entry was posted in General Emotions for singles, dating, married, Divorced, Relationships and tagged Tunde Oke Died In Police custody the story behind his death. Oh My God ! Can’t believe that this injustice is still being meted out to Nigerians in this era ! We seek Justice for Tunde ! !